The 'Sparkle' Strawberry Plant is a late-season strawberry variety producing bright red, glossy, medium-sized berries loaded with flavor. Sparkle is a favorite June-bearing plant among our northern growers due to its winter hardiness and with our coastal gardeners due to its tolerance to salty soils. Sparkle is extremely tasty when fresh, frozen or prepared in pies and canned preserves. The Sparkle Strawberry plant is resistant to Red Stele and Powdery Mildew. 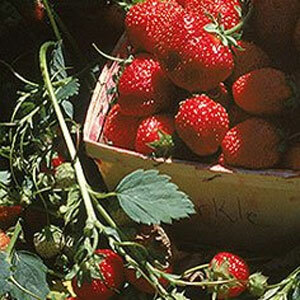 All our 'Sparkle' Strawberry Plants are organically grown and shipped in fine quality growing medium. They are guaranteed to arrive alive and ready to plant. Comment: These came wrapped up nicely, I soaked them in water like they said. I wasn't ready to plant so, I put them all in a large container tub and planted close together in organic dirt. They started growing strong and I made a cool bed for my strawberries and transplanted them yesterday morning. They look great still.